We’ve waited for this day all week and it did not disappoint. 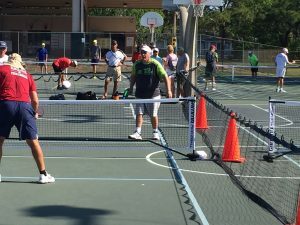 All three pro brackets ended up with great matchups and super high level pickleball. But, before the final gold medal pro matches, there was plenty of action from the 2.5, 3.0 and 3.5 mixed divisions as they navigated some really big bracket on their way to US Open medals and the Mixed Pro players battled for their spot in tonight’s CBS Sports Network’s recorded upcoming broadcast, May 19th and 26th. Little did I know I was photographing both teams (Simone and Oliver plus Matt and Lucy) who would be competing for Gold tonight. 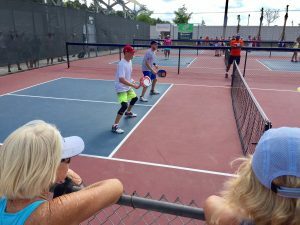 Equally fun to watch was the Junior Boys competition, where I saw the future of pickleball growing right before my eyes. Our sport is going to be just fine. Spent a little time on the Championship Court watching what may have been the most entertaining match of the day as Daniel Moore and Sarah Ansboury had an epic three game bronze medal battle with a couple of relatively new faces on the pro scene in Joey Farias and Catherine Paranteau. Wow, great point after great point until Daniel and Sarah walked away the winners, 11-9, 8-11, 13-11. 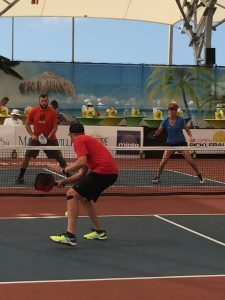 An interesting observation as this foursome warmed up for the match was the fact that all four players were representing different paddle companies. 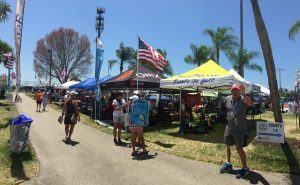 In the picture below, you’ll see Catherine with a Pro-Lite Supernova, Joey with an Engage Encore, Daniel with a Paddletek Tempest Wave and Sarah with one of Head’s new paddle offerings, the XTREME. Interesting time to be in the paddle business. So, it has been a great experience. The US Open team did a great job of pulling together a first class event. It will be interesting to see what type of feedback they get when they send out their post tournament survey. 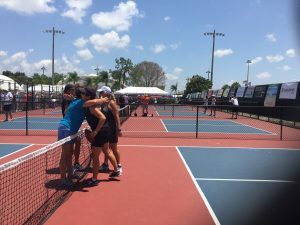 There were certainly things that players did not care for in the tournament part of the event, such as many matches not having referees, when most players outside of Florida are accustomed to having a referee for each match. Also, I asked players all week, and I found ONE, yes ONE player who actually liked the format of play where if you lose in the winners bracket, you now cannot come back and win Silver or Gold. 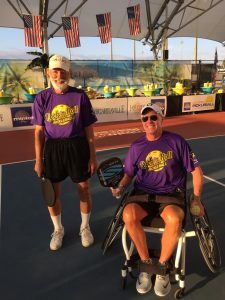 Most people claimed it just didn’t feel like pickleball because we are so accustomed to 40% of Gold medal winners coming back to force the dramatic final game to 15 to win gold. 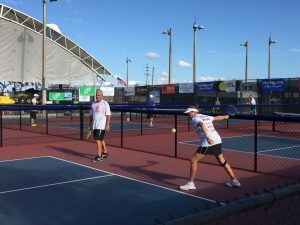 Overall the US Open is an event that everyone should put on their pickleball bucket list at least once. Lot’s of fun and lots of friends all together for a week. What could be greater. 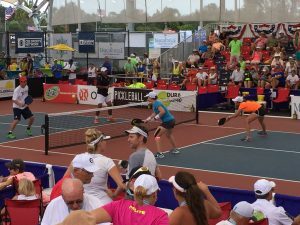 We certainly want to thank everyone who stopped by the Pickleball Rocks booth this week. You were the reason we came and we are grateful. Now it’s off to Yonah, Georgia and Philadelphia tournaments to play and teach some clinics next. 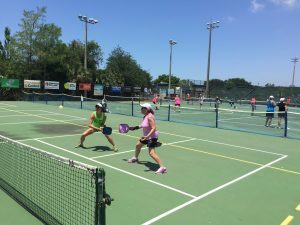 Look forward to seeing all of you on the pickleball trail again soon. Not much happened today. JUST KIDDING. 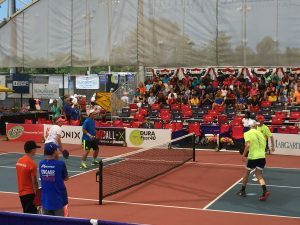 Lots of great mixed skill level matches, plus today brought together some of the best Men’s and Women’s Pro doubles teams in the world. 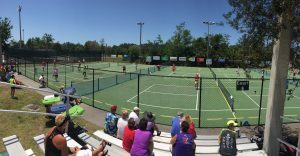 Wow what a a day for watching great pickleball. 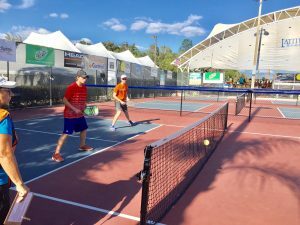 Since Zack and I have been incredibly busy at the Pickleball Rocks booth (thanks to many of you) all week, today was a great day for me to catch up with a lot of friends. I was fortunate to catch many of them in action, starting with Indiana friends, Tom Sparks, Mary Kojak and Matt Kelsch battling it out in a mid round 4.0 match. 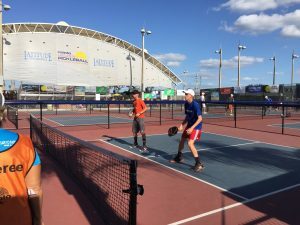 Next I stopped by the ZING ZANG center court only to find some more Midwest players, Ryan Goodwin and Sharon Hall, playing their first ever match on center court. I’m sure that will be something they will never forget. Then as the day started heating up (made it to around 95 degrees again today and oh my gosh, it’s not a dry heat. 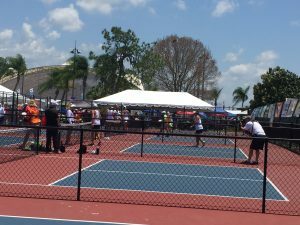 ), I wandered into the bank of courts where lots of our Pro friends were playing some amazing pickleball and crowds were building quickly. Everywhere you turned there were people like Brian Staub and Bonnie Williams taking on Tyler Sheffield and Mona Burnett. Also caught a little of Dave and Kyle cruising through one of their early round matches right across the aisle from Christine McGrath and Sarah Ansboury. The play just got better and better as the day wore on. Stopped at the misting tent several times today as did many players and fans. That thing is a life saver and it stayed busy. Finally, we did something that we had meant to do all week, but just didn’t take the time. 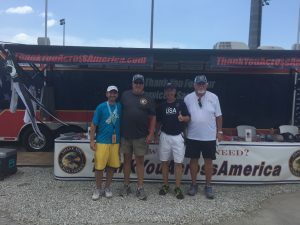 We made the short walk to see the Thank You Across America semi tractor trailer truck and helped fill their money jar with a donation from our Pickleball Rocks family. 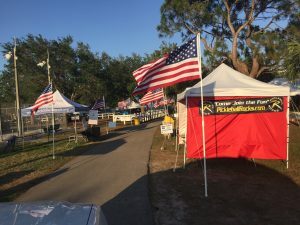 If you haven’t taken the time yet, please, please, please take just a short few minutes to stop by their truck and display and thank a war veteran with a donation in their jar. It’s as easy as that. Then we packed up for the day, returned to our host home and started the preparation for the long drive home beginning Saturday night. 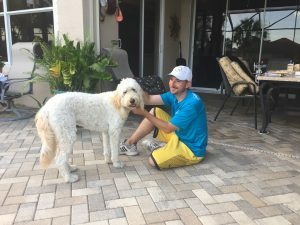 Caught Zack saying goodbye to his new friend, Labradoodle Gracie. She became his nightly running buddy while he was here. I’m sure he is going to miss her. Day 6 was all about the ladies. 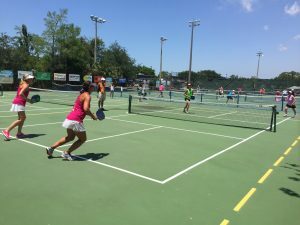 Today was Skill Level Ladies Doubles day and we saw some amazing play. And of course we saw a lot of ladies teams beating each other senseless on the court, only to finish with a hug. 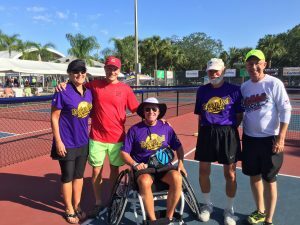 That is what makes pickleball special. Hope we never lose that. Took some time to visit the place the players call Tent City today. 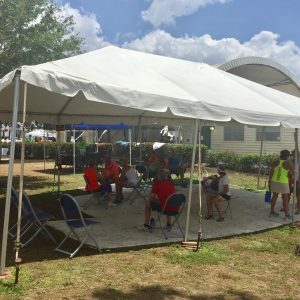 Everyone brings a tent and creates a magical place for players to hang out throughout the week. Great place to catch up with old friend and make new ones. Noontime brought a unique event to the ZING ZANG Championship Court. 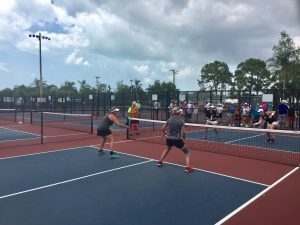 We stopped in to watch our favorite pickleballer, Stephanie Lane, holding court with Dave Weinbach and some of the top USAPA Junior Pickleball players in the country as they entertained a 5th grade class from nearby Avalon Elementary School. Everyone seemed to have a great time. 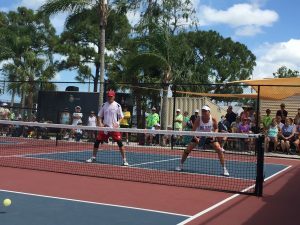 As the afternoon wore on, it was fun to watch as some of the top pros, including Irene Tereschenko, Lucy Kovalova and Jack Oxler, began to practice for what should be a memorable weekend. As I headed to the outer parking lot to bring the Pickleball Rocks mobile in to load up for the night, I happened across newly arrived Aspen Kern. Upon asking Aspen how he was doing, the first thing he said was, “it’s hot”. Aspen is a man of few words, but with projected temps in the mid 90’s for both Friday and Saturday, I’d have to agree. Things are going to be hot both on and off the courts. Next to the USAPA National tournament, this is the greatest get together of the top players in the country. Should be really fun to watch. Have a great evening everybody. Yay, play day for Rocket. Played the Men’s Senior 5.0 today. Got 4th. Some people call it the aluminum medal. I just say it stinks. So close, yet so far thanks to two losses to future Nationals partner Darryl Noble. Looking forward with playing with Darryl rather than against him. Today started off great. I happened to be walking past the Zing Zang Championship Court around 7:30 am this morning and I hear the familar ping of someone practicing on center court. I took a look, and low and behold there was Indianapolis friend Don Nixon practicing with partner Michael O’Leary for their initial 3.0 match of the day. 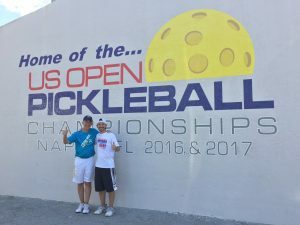 Just had to stop and say hi and grab a quick picture of them proudly wearing their Rock N Roll Pickleball shirts. Quite a good looking team. Luckily their court assignment for their first match was the great center court, so they had a nice crowd watch them put up a great battle, but alas a loss. Their next match, their opponents weren’t so fortunate. A win for Don and Mike at the US Open. Awesome to watch. After their match 2 win, I took good friend and current US Open Men’s Pro Gold Medalist, Dave Weinbach to the meet this dynamic duo. Just another set of great friendships formed in our great sport. 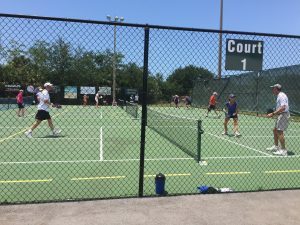 After watching Don and Mike play, I headed over to the Avalon bank of courts to see what all the commotion has been about all week. Lot’s of unhappy players and now I know why. Sadly, players who paid a lot of money to enter and travel to the US Open are being asked to play on courts that are downright dangerous. I was only there for about 30 minutes, but saw two people get caught up in the very close side fences and one player go down. I imagine the post tournament survey will be heavily laden with complaints about the Avalon courts. I’m sure the US Open will correct this one before next year’s event. 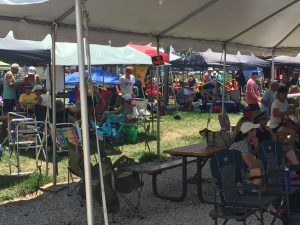 On a very positive side, the misting tent came on around 2:45 today and provided some great relief for those of us still on the courts this afternoon. Hadn’t seen it operational since Sunday. Thank you, thank you, thank you, US Open. It will be great for the players in the coming days, since it sounds like some serious heat is coming. Had another great day at the PB Rocks booth. Thanks again to everyone who stopped by to say hi. We appreciate each and every one of you. Topped off the day with a stop at the Thank You Across America truck to meet President, Mark Michael. Mark patiently told me all about this great organization. 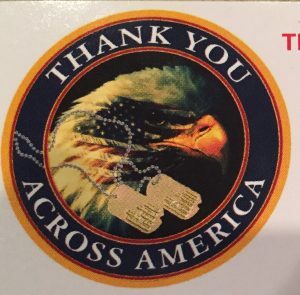 100% volunteer run and 100% of every donation goes straight to helping US veterans. 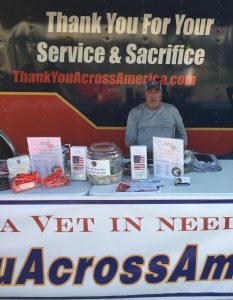 Chapters are popping up everywhere so if you know a vet in need of help of just about any kind, put them in contact with Mark and his team at www.ThankYourAcrossAmerica.com . Please take a minute or two to visit their beautiful semi tractor trailer truck. And donate if you can. Reminder for those playing tomorrow, Friday and Saturday. It’s going to get hot!!!!! So hydrate, hydrate and certainly hydrate some more. It’s vital for your play, but more importantly vital for your health. Just want to start today’s update by saying how thankful Zack and I are that you are sharing our daily updates with your friends and families, either through email or Facebook. 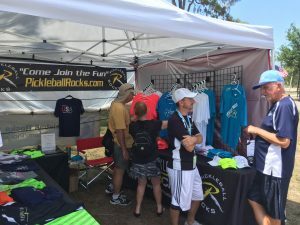 But more importantly, how grateful we are for all the people who have stopped by the Pickleball Rocks booth in the last three days, to either pick up their FREE Pickleball Rocks Car Magnet or to just say hi. We love seeing each and every one of you. 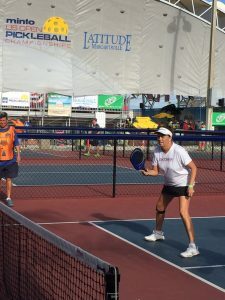 Pickleball Rocks would not be the best selling pickleball apparel brand in America without you and your fanatical support. Thank You! 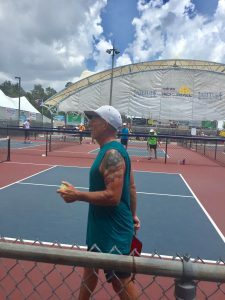 Today was a day off from playing for me, so I took some time to hit a few spots around this massive venue and yes, watch a little US Open pickleball. 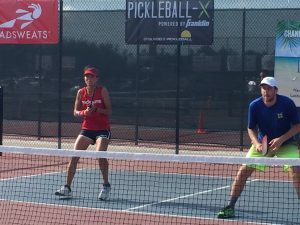 Lots of great Age Mixed Doubles matches to choose from. 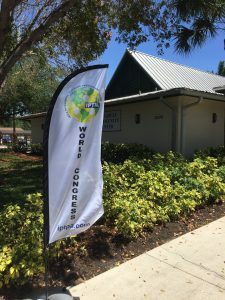 I stopped by the home of the first ever IPTPA World Congress gathering. 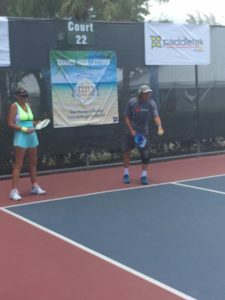 The International Pickleball Teaching Professional Association is growing like gangbusters and the Congress was the first anniversary meeting to review the triumphs of year one and to get the all important continuing education points needed to maintain our IPTPA certification. 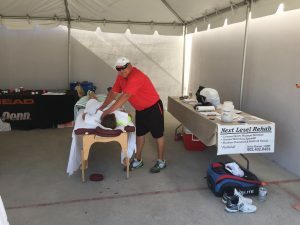 Next I stopped by to see if I could schedule a sports massage with ATP Massage Therapist Brian Horner, but alas, he is booked up for about the next 100 years. 🙂 Yes, he’s that good. 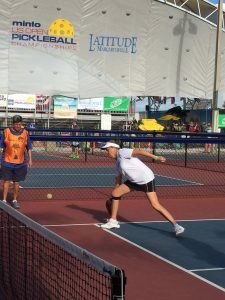 Finally, after spending a little time helping Zack sell a few shirts and hats, I topped off a great day, watching our amazing Pickleball Rocks Teammate, Stephanie Lane play her way to a US Open Bronze medal in the loaded 45+ Mixed Age division. Very proud of our gal Steph. Both she and partner Marcus Luke played great. So, I polished off a big plate of pasta at Olive Garden tonight as the carb loaded begins for tomorrow’s Men’s 5.0 Doubles event. Should be great fun with many old friends. Can’t wait. Good night everybody. As my mom used to say each night, “sleep tight”. Never really knew what that meant, but I still say it to my kids, grandkids and friends each night, so I’m guessing it’s good.